The Global Savings Group (“GSG”), a leading operator of a global online platform that curates and distributes shopping recommendations, deals, and discounts worldwide, has announced its partnership with Tradera, the leading online auction-style marketplace in Sweden, expanding its efforts in the Nordics. Munich, July 06, 2017 – The Global Savings Group (“GSG”), a leading operator of a global online platform that curates and distributes shopping recommendations, deals, and discounts worldwide, has announced its partnership with Tradera, the leading online auction-style marketplace in Sweden, expanding its efforts in the Nordics. 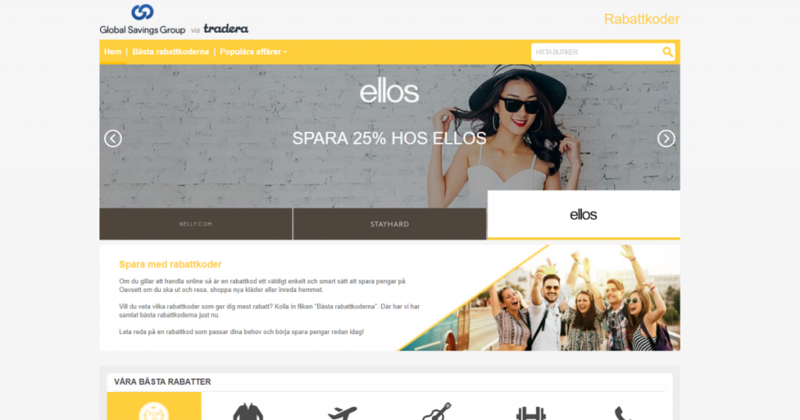 The new website will enable Swedish consumers to discover the best opportunities and save on shopping in a wide range of categories on tradera.com/rabattkoder. E-Commerce in Sweden is growing. According to the report “E-commerce in the Nordics 2017” by PostNord, a leading Nordic postal service, 67% of Swedish consumers shop online every month. Swedes spend around EUR 151 on average each month. It is also estimated that they shopped online for SEK 84.8 billion (EUR 8.5 billion) during 2016. This is an increase from SEK 61.4 billion (EUR 6.5 billion) in 2015. Today, the Global Savings Group is building a comprehensive distribution platform to enable consumers around the world to make smarter shopping decisions by delivering the right mix of products, recommendations, deals, and discounts via more than a hundred select digital assets operated by GSG as well as leading global publishers, such as SPIEGEL ONLINE in Germany, Daily Mail in the UK or Ekstra Bladet in Denmark. The Group is represented by brands in about 25 countries with an e-commerce market totally SEK 4.81 trillion (EUR 500 billion). The group’s brands are market leaders in many countries in the online voucher and savings segment. Pouch, the UK's No.1 money-saving browser extension and stars of BBCs' Dragons Den, have been acquired by German PubTech platform Global Savings Group for an undisclosed amount. The Global Savings Group (GSG), a PubTech platform for commerce content currently operating more than 100 digital assets in collaboration with some of the world’s leading media publishers, has cemented a year of growth with the launch of a new group website. Global Savings Group (GSG), the leading global provider of Commerce Content Solutions, today celebrated the 5th anniversary of its first ever white labelled portal launched with a media partner. The Global Savings Group (GSG), a leading global provider of Commerce Content Solutions, has been named one of the Top 25 Startups in Germany by LinkedIn – cementing the Munich-headquartered company’s status as one to watch on the global stage. Global Savings Group is partnering with the news outlet FOCUS Online and the technology portal Chip.de of BurdaForward. The domains gutscheine.chip.de and gutscheine.focus.de will be operated by the Global Savings Group from February 2019 and April 2019 respectively.